If you’re looking for the video of the speech, click here. It has now been twelve weeks since my administration began. And I think even our critics would agree that at the very least, we've been busy. In just under three months, we have responded to an extraordinary set of economic challenges with extraordinary action - action that has been unprecedented in both its scale and its speed. PRESIDENT OBAMA: Good morning. I ran for President pledging to change the way business is done in Washington and build a government that works for the people by opening it up to the people. And that means restoring responsibility and transparency and accountability to actions that the government takes. And working with the Congress over my first 50 days in office, we've made important progress toward that end. Good morning Marines. Good morning Camp Lejeune. Good morning Jacksonville. Thank you for that outstanding welcome. I want to thank Lieutenant General Hejlik for hosting me here today. “I'm here today to talk about a crisis unlike any we've ever known - but one that you know very well here in Mesa, and throughout the Valley. In Phoenix and its surrounding suburbs, the American Dream is being tested by a home mortgage crisis that not only threatens the stability of our economy but also the stability of families and neighborhoods. It is a crisis that strikes at the heart of the middle class: the homes in which we invest our savings, build our lives, raise our families, and plant roots in our communities. 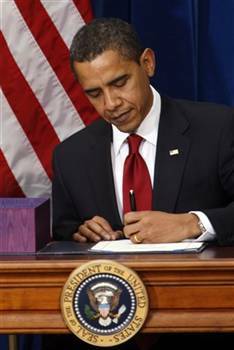 :: Just a short time ago, President Barack Hussein Obama signed in to law the most sweeping economic legislation since the New Deal. It is considered a victory for his administration, and a victory for the American People. TRANSCRIPT of President Obama's remarks as prepared for delivery, at the signing of the economic stimulus bill. “It is great to be in Denver. I was here last summer to accept the nomination of my party and to make a promise to people of all parties - that I would do all I could to give every American the chance to make of their lives what they will and see their children climb higher than they did. I am back today to say that we have begun the difficult work of keeping that promise. We have begun the essential work of keeping the American dream alive in our time. The Full Inaugural Speech of President Barack Obama, as prepared for delivery. The video is posted here. Fellow citizens: For eight years, it has been my honor to serve as your President. The first decade of this new century has been a period of consequence - a time set apart. Tonight, with a thankful heart, I have asked for a final opportunity to share some thoughts on the journey we have traveled together and the future of our Nation. Before we begin, I’d like to say a few words about the necessary step taken today to help avoid a collapse in our auto industry that would have devastating consequences for our economy and our workers. With the short-term assistance provided by this package, the auto companies must bring all their stakeholders together – including labor, dealers, creditors and suppliers – to make the hard choices necessary to achieve long-term viability. The auto companies must not squander this chance to reform bad management practices and begin the long-term restructuring that is absolutely necessary to save this critical industry and the millions of American jobs that depend on it, while also creating the fuel-efficient cars of the future. Whenever I have been asked how I measure the strength of the American economy, my answer is simple: jobs and wages. I know we will be headed in the right direction again when we are creating jobs, instead of losing them, and when Americans are gaining ground in terms of their incomes, instead of treading water or falling behind. In recent weeks, I’ve announced members of my economic team who will help us make progress in these areas. 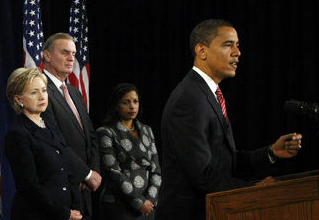 The release details the federal corruption charges brought against Illinois governor, Rod Blagojevich and his chief of staff, John Harris on December 9, 2008. “Illinois Gov. Rod R. Blagojevich and his Chief of Staff, John Harris, were arrested today by FBI agents on federal corruption charges alleging that they and others are engaging in ongoing criminal activity: conspiring to obtain personal financial benefits for Blagojevich by leveraging his sole authority to appoint a United States Senator; threatening to withhold substantial state assistance to the Tribune Company in connection with the sale of Wrigley Field to induce the firing of Chicago Tribune editorial board members sharply critical of Blagojevich; and to obtain campaign contributions in exchange for official actions - both historically and now in a push before a new state ethics law takes effect January 1, 2009. 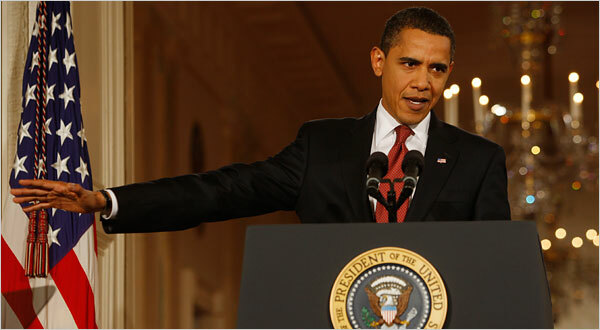 ►Obama announces new Secretary of Veteran Affairs, retired General Eric K Shinseki, an early dissenter re the Iraq war. The full full text of President-elect Obama's announcement after the jump [thanks to the Huffington Post for the text/transcript]. Earlier this week, I announced key members of my national security team. They have served in uniform and as diplomats; they have worked as legislators, law enforcement officials, and executives. They share my sense of purpose about American leadership in the world, my pragmatism about the use of power, and my vision for how we can protect our people, defeat our enemies, and meet the challenges of the 21st century. President-elect Obama announces his "team of rivals" as with a statement deriding "group think", he turns a page in history. You may now (well almost - she still has to undergo confirmation hearings) call Hillary Clinton "Madame Secretary". As I type, President-elect Obama is formally announcing his national security team, which will include Hillary Clinton as the secretary of state, Susan Rice as the US ambassador to the UN, General James L. Jones as national security advisor, Eric Holder as the attorney general, Janet Napolitano as the secretary of homeland security, and Robert Gates as the secretary of defense. Video and transcript after the jump. PRES.-ELECT OBAMA: Please be seated. Good morning, everybody. Yesterday, we talked about the need to jumpstart our economy. I speak to you today mindful that we meet at a moment of great challenge for America, as our credit markets are stressed and our families are struggling. But as difficult as these times are, I'm confident that we're going to rise to meet this challenge, if we're willing to band together and recognize that Wall Street cannot thrive so long as Main Street is struggling, if we're willing to summon a new spirit of ingenuity and determination and if Americans of great intellect, broad experience and good character are willing to serve in our government at its hour of need. The news this past week, including this morning’s news about Citigroup, has made it even more clear that we are facing an economic crisis of historic proportions. 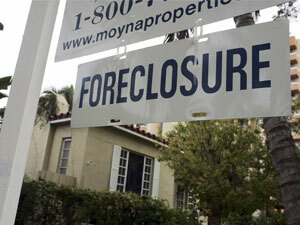 Our financial markets are under stress. New home purchases in October were the lowest in half a century. Recently, more than half a million jobless claims were filed, the highest in eighteen years – and if we do not act swiftly and boldly, most experts now believe that we could lose millions of jobs next year. Verbatim transcript of President-elect Obama's weekly video address, November 22, 2008. Annotation and bolding is mine. View the video here. “There are no quick or easy fixes to this crisis, which has been many years in the making, and it's likely to get worse before it gets better. But January 20th is our chance to begin anew with a new direction, new ideas, and new reforms that will create jobs and fuel long-term economic growth. I have already directed my economic team to come up with an economic recovery plan that will mean 2.5 million more jobs by January of 2011. A plan big enough to meet the challenges we face, that I intend to sign soon after taking office. We'll be working out the details in the weeks ahead, but it will be a two year, nationwide effort to jumpstart job creation in America, and lay the foundation for a strong and growing economy. “These aren't just steps to pull ourselves out of the immediate crisis, these are the long-term investments in our economic future, that have been ignored for far too long, and they represent an early down payment on the type of reform my administration will bring to Washington. Government that spends wisely, focuses on what works, and puts the public interest ahead of the same special interests that have come to dominate our politics. >Are All of the Republicans NUTS or Just the Evangelicals?